#7699 brunette straight- legs Baggie Francie (1975-1976) She was never part of Mattel's regular line of dolls and was not in their 1975 catalog. She only came with brunette hair and wore a yellow two-piece swim suit. Her legs are made of a harder material than what you normally see on most dolls. If you think you have a blonde beauty, she is Baggie Casey! 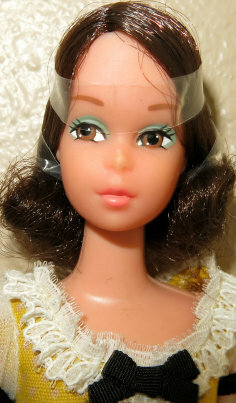 Francie was a very popular doll. In 1972 Mattel released #3313 Busy Francie and two German models, #8520 German Francie and #3313 Busy Germany. In 1973 Quick #4222 Curl Francie was available. In 1975 there was the hard to find and very pretty straight leg brunette #7699 "baggie" Francie. They all have blue eyes except for the German dolls. They have brown eyes. 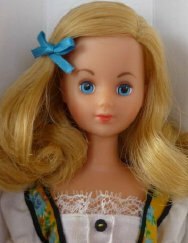 The U.S. dolls were available as blondes or brunettes except for Baggie Francie. She had brunette hair only. The German dolls were blonde only. Both Busy Francie Germany and German Francie were only made for the German Market (1972). 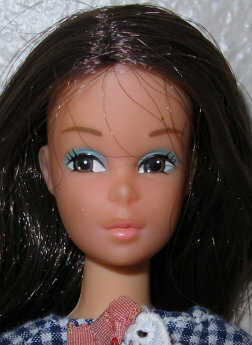 Mattel used the same head mold for both dolls, but different from the U.S. Version. Her set included a TV, phone, record player, suit case, brown tray with 2 glasses.